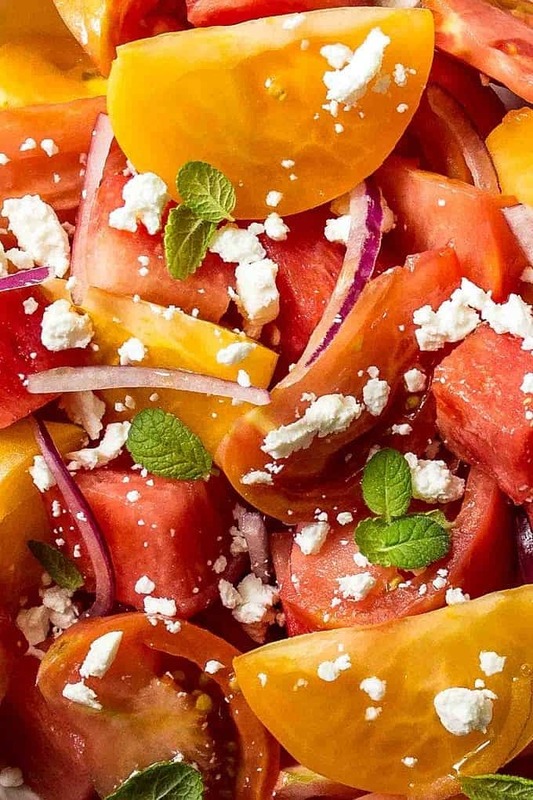 Juicy, colorful and healthy, this Watermelon Salad With Goat Cheese features all the goodness of summer produce – sweet watermelons, flavorful heirloom tomatoes and vibrant mint. Make it for a picnic or backyard BBQ. Super simple and delicious! Now, that summer is fast approaching, I can’t wait for the farmer’s market to hit the streets of our city. One of my favorite things to shop at farmer’s market is tomatoes. I adore big, juicy heirloom tomatoes and their earthy flavor doesn’t compare to anything else. I also love that they always come in funny, uneven shapes which makes them super unique. Since, I was preparing this salad before farmer’s market opened its doors, I had to make a quick trip to our local Fairway market that sells the biggest tomato varieties that I know. Luckily, I was able to find juicy and colorful heirloom tomatoes as well watermelon to make you another fresh and delicious salad. And just like my healthy Beets And Arugula Salad, thisWatermelon Salad With Goat Cheese is a must this summer. This watermelon And Goat Cheese Salad With Mint is super easy to make. It requires just a handful of ingredients. 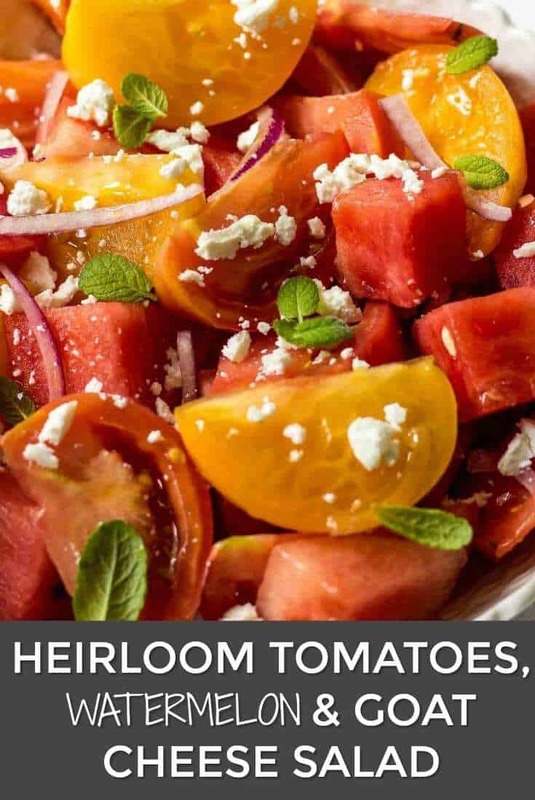 In my recipe I used watermelon, multi-colored heirloom tomatoes, a bit of red onion, goat cheese and a sprinkling of mint leaves. I also made a simple honey-mustard vinaigrette to intensify the taste of my salad even more. Tomatoes. Pick the freshest and the ripest ones. If possible, make a trip to your local Farmer’s Market. If not, look for heirloom or beefsteak tomatoes at your local grocery stores. And always smell them. They should be a flavor bomb. Watermelon. When picking the watermelon, look for the creamy yellow spot on one side of the fruit. It means that it’s ripe and ready to be consumed. I found a great article that explains how to pick the best watermelon. Cheese. For my recipe, I chose goat cheese, but Feta or Halloumi would work just as good. What goes well with watermelon salad? Grilled pork chops, or Steak Chateaubriand would be my choices. But seafood recipes like grilled or roasted salmon, halibut or sea bass would also pair well with this salad. In a small bowl whisk together all ingredients for the dressing. 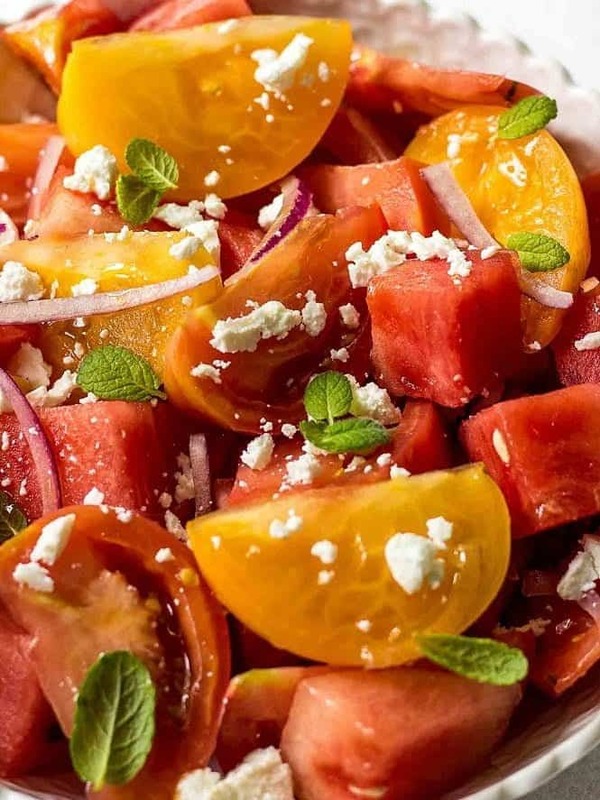 In a large serving bowl combine heirloom tomatoes,watermelon, goat cheese and red onion. Drizzle the salad with the dressing and mix to combine. Sprinkle with the mint leaves and serve. If you make this Watermelon Salad With Goat Cheese, make sure to snap a picture and post it on Instagram with a hashtag #lavenderandmacarons.